/ Upright GO is an Upright YES! Upright GO is an Upright YES! It’s a posture geek’s dream! I open my mail to find a little box. It seems innocuous, but BOOM. Suddenly, I have in my hot little hands, the future of posture training. I had the distinct pleasure of trying out the new Upright GO. 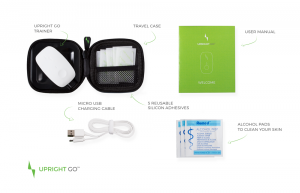 The Upright GO is a posture training technology gadget that is so small in size, it could easily go unnoticed. But once it’s on your body, you will not forget it’s there. And, it has potential to be a game changer to your body’s alignment. I spend countless hours preaching about how “sitting is the new smoking”. And how leaning over the computer screen is causing your neck and back pain. (And probably also your hip pain, knee pain and overall body discomfort.) It’s so easy to hunch. It’s much harder to sit upright. We actually have to “use” our bodies and muscles to remain upright. If you don’t do it often enough, these muscles atrophy which make it even harder to stay in good sitting position. Enter: Upright Go. 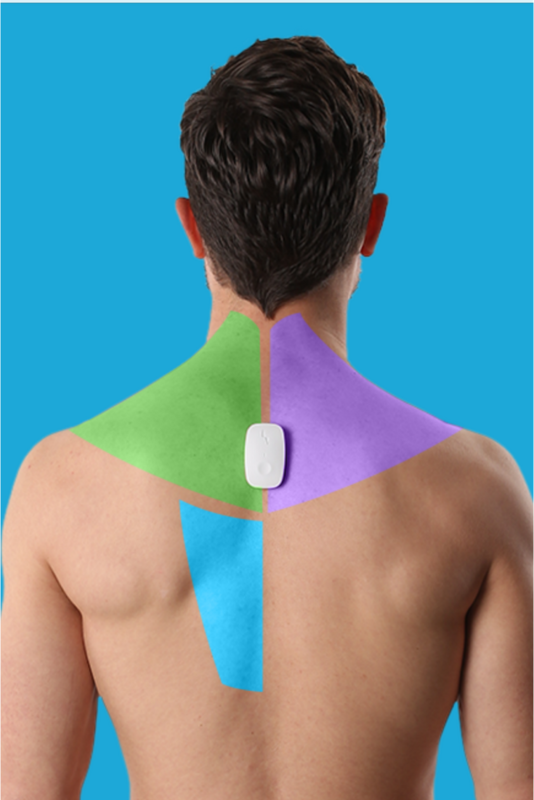 A small wearable device that you place on your upper back area. It’s designed to “buzz” you when you fall out of good alignment. And let me tell you, it’s much more comfortable than mom poking you in the back to sit up straight. Now wait.. You clearly can’t wear this all day. You have to bend over to pick stuff up, or talk to your kid, or cook healthy meals on your stove. So despite the fact that you can wear it all day, you shouldn’t actually have it set to buzz you all day long. That’s where YOUR motivation comes in. You link the device to a phone app and set the device on “training” mode, where it will buzz you for a short about of time. This way you can make sure you’re at your desk and can schedule your “training session” for the valuable time that you are working diligently at your computer. I found myself able to hold proper posture while typing at my laptop. I would lose position when my phone buzzed. So I got better at picking up my phone, and using it like I’ve already suggested in this previous blog post (I clearly wasn’t always following my own advice). My favorite thing about this device was it’s ease of use and onboarding instructions. It arrived in the perfect little package, with super easy to follow directions. I downloaded the app, registered my account, and within 10 minutes I was able to test the device. 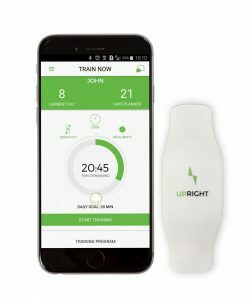 I placed it on my upper back as directed, quickly calibrated it to know my ideal position, and then set a training session to test it out. When I was done ‘training” I switched it to “tracking”. In this mode, it tracked how well I was holding my posture, without the buzz that would come if I got up to use the restroom or make my salad. I LOVED the progressive element of the training mode. It started with a short training time (10 mins) and incrementally got longer as the days progressed. 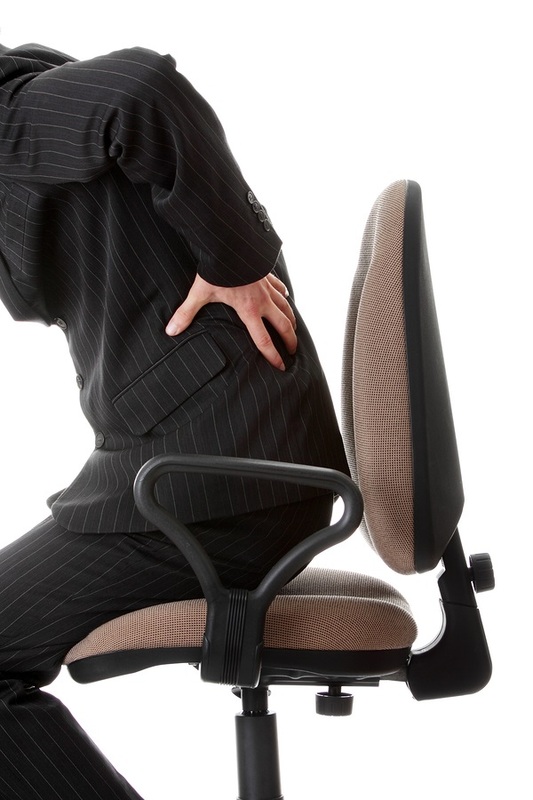 This is exactly how this posture geek would recommend you ease into a more upright position. Your muscles need to get used to it! I believe that this device, paired with daily posture exercises/stretches done after your work day, will make for a winning combination. The customer service was excellent, including follow up emails checking with me to make sure I didn’t have any questions. The app was quick and easy and integrated well with the device. It came with adhesives and offered ways for me to purchase more. I never had a reason to not use my Upright Go. I forgot about it one day, but luckily remembered it before I headed into the shower. This is the only “con” I can provide during this stellar product review. It’s not waterproof! Be careful not to wade into water with your Upright Go (it would soon become an “Upright No”). Honestly if you sit at a day job (even if you stand), this product is very worth the investment ($99). Keep it at your desk, in it’s super slim case, and pop it on in increments throughout the day. Run competitions with your colleagues for motivation and challenge yourself to hold good posture for longer periods of time. The combination of advanced technology, friendly interface, and gentle “mom-like” reinforcement, forces this Posture Geek to give Upright GO two enthusiastic thumbs UP! Comment below if you’ve tried the Upright GO or have plans to in the near future… I am curious to hear what YOU think!